What is Double Exposure Blackjack? 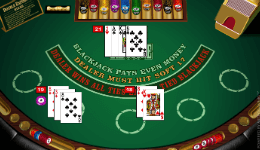 Is regular old blackjack getting a little boring and repetitive? Do you still love the game but are looking for something a little different to bring the excitement back? Are you looking for an extra something to rekindle your passion for blackjack? If the answer was yes to even just one of these questions, then you need to learn more about playing double exposure blackjack. Double exposure blackjack is a variation of the regular blackjack, with a few modifications and twists to the standard game. There’s no specific information on the timeline of when this game was invented or when it started becoming more popular. The creation of the game is often credited to Richard Epstein but unfortunately, he failed to patent it and thus it became public. It’s not available in all casino sites, unlike the regular blackjack, but there are some places that offer the game already. By the way, some casinos may call it “Dealer Disclosure” or “Face Up 21”. While the essence and some rules of the game still remains the same, there are more than a few things that makes this variation different from the regular blackjack game. 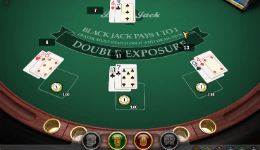 However, the main feature of double exposure blackjack is that both of the dealer’s cards are exposed. 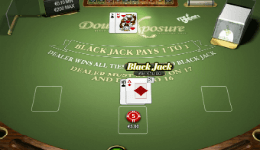 Discussed below are some of the double exposure blackjack rules that sets it apart from the standard game and other variations though of course, the rules will sometimes vary depending on the casino offering the game. The game is usually played with 6 or 8 regular playing card decks. To offset the dealers’ disadvantage the payout on blackjacks is an even 1:1, instead of the usual 3:2. 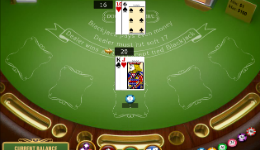 When the player ties with the dealer, the dealer automatically wins the hand unless it’s a natural blackjack for the player. You can split all cards of equal value and up to four hands. This rule varies from one version to another. Most casinos allow you to double down on a hands that have a value of 9, 10, or 11. You can also double down after splitting cards. Allows low stakes bets of $0.10. The official payout is 99.33%, however we are not sure how they reached it since according to our caclulations it is a bit higher, 99.45%. Blackjack in general is mostly a game of luck. You never know what card you’re going to be dealt, so the odds are always in the hands of fate. However, this doesn’t mean you have absolutely no control. There are some ways in which you can still have some control your profits and losses. Because of the double down on 9,10, and 11 rule, doubling down usually isn’t the correct strategy to take. If you’re holding an eleven and the dealer’s hand is worth 4 – 9 or 12 – 15, don’t double down. If you have a ten and the dealer’s cards are 10 – 8 or 12 – 15, double down. If your cards are a nine, double down only when the dealer’s cards are 5 – 6 or 12 – 15. Do not split aces when faced with a dealer’s eleven! In this case, hit your cards. As long as you have the basic knowledge on regular blackjack, you could use the additional knowledge gained from the dealer’s double exposure and work it to your advantage. It certainly reduces the errors made when guessing and although some rules work against the player’s favor, a good blackjack player will be able to work around these disadvantages. For example, if you can see that your hand is lower than the dealer’s you’ll know that the only option you have left would be to hit. If both yours and the dealer’s hands are high in this case, you might still lose if you are dealt a higher card, but at least you won’t have to guess whether to hit or stand, and you never know with games like this – you might still win it. While the double exposure blackjack odds may not be as good, the game is as competitive and exciting as ever.